We are occupied in manufacturing as well as supplying the best quality Electronic Milk Cream Separator. Our Electronic Milk Cream Separator products are chiefly designed to separate out cream from milk in a very rapid and competent manner and it has the speed of about 1425RPM. We fabricate our products employing first-rate quality materials as well as constituents and according to the state-of-the-art technology in observance to the international quality norms. Our dairy equipments are quality confirmed. Our equipment has S.S. Milk Pump attachment for Milk Suction functionality. We likewise provide standard tools & accessories along with the product. The effective performance of this product is due to its Three Phase Electric Motor of 1.00 HP. This machine is profitable as it offers great productivity in a very power efficient way. We supply our products at exclusive prices. 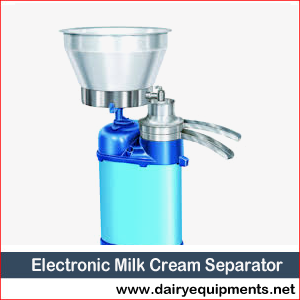 We are the top Electronic Milk Cream Separator exporter supplier of India. Machine Capacity : 1000 Liter / Hr. Machine Weight: Net: 100 Kg Gross: 210 Kg Approx.